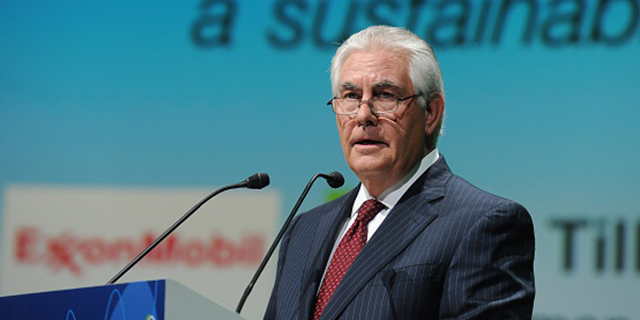 Rex Tillerson, President-elect Donald Trump’s choice for secretary of state, faces questions over potential conflicts of interest because of his current job as chairman and chief executive of Exxon Mobil, the international oil giant. While Tillerson wouldn’t be the first secretary of state to come from a big-business background, he would be the first whose past experience was entirely in the private sector. At least four secretaries of state previously worked as top executives for large private-sector companies, according to a Pew Research Center analysis of biographical data from the State Department and other sources. Some of them sparked concerns that their business interests might affect their future diplomatic duties. But, unlike Tillerson, all four also had worked in high-level government or military posts before becoming the nation’s top diplomat. Immediately prior to serving as Ronald Reagan’s secretary of state from 1982 to 1989, George Shultz spent eight years as president of Bechtel, a sprawling engineering and construction firm. Shultz’s Bechtel ties prompted questions on several fronts, ranging from the firm’s business dealings in the Arab world to its involvement in nuclear technology. But those concerns didn’t amount to much in the end – the Senate Foreign Relations Committee and the full Senate both approved Shultz unanimously. Shultz also had a long track record of government service to point to. Earlier in his career, he had served as secretary of labor, director of the Office of Management and Budget and secretary of the treasury. Edward Stettinius, who served as secretary of state from 1944 to 1945 under Franklin Roosevelt and then Harry Truman, brought his own high-level corporate experience to the State Department. Stettinius worked in top positions for two major American firms before joining State: first as a vice president at General Motors and later as chairman of the board for the United States Steel Corporation. Like Shultz, Stettinius was easily confirmed by the Senate. But the one senator who did vote against him, North Dakota Republican William Langer, claimed Stettinius was being inserted into the government as a representative of the J.P. Morgan interests, which, according to Langer, included the United States Steel Corporation. Stettinius’ private-sector experience may have drawn attention, but he was no newcomer to the government, or even to the State Department. In fact, he was undersecretary of state when Roosevelt nominated him to lead the department, and had previously served as a special assistant to the president, among other roles. Two other secretaries of state also served in corporate jobs prior to their time as America’s top diplomat. Alexander Haig, Reagan’s secretary of state from 1981 to 1982, was president of United Technologies Corporation, an aircraft manufacturer and defense contractor, for about a year. And Robert Bacon, who led State for just 37 days at the very end of Theodore Roosevelt’s presidency in 1909, had spent nine years as a partner at J.P. Morgan. Both men had also served in the public sector, though. Haig served as chief of staff to two presidents and had a long military career leading up to his State Department appointment, eventually rising to become supreme allied commander in Europe for five years. Bacon served as assistant secretary of state before Roosevelt chose him to head the department. Of the 66 men and women who have served as secretary of state so far (Daniel Webster and James Blaine each served twice), Shultz, Stettinius, Haig and Bacon most closely approximate Tillerson in the kind of private-sector experience they brought to the job. At least five other secretaries of state also worked in the private sector, but their experience was different. Four of them, for example, worked in the journalism industry, while a fifth, Hamilton Fish, managed personal real estate holdings. It’s important to note that Tillerson’s private-sector experience far outweighs that of any prior secretary of state – he has spent 41 years at Exxon Mobil. And while his lack of public-sector experience may be unique among secretaries of state, he would be similar in that respect to the man who chose him: In November, Trump became the first person without government or military experience to be elected president.